She is a small lady who seems to hold herself well. Most of the markings for age are in the grey that streaks her hair. She has tattoos hidden on her legs. Spending most of her childhood travelling throughout the stars as part of a travelling circus. Her formative years were spent training up to become one of the main attractions. By the time she was 12 she was starring in the show on the highwires and trapeeze. She began to feel that her abilities were being wasted. Her family knew that she wouldn’t be happy as a circus star and at the age of 16 sent her to live with her aunt on Earth where she would study up and get herself into Starfleet Academy. While studying to become a Starfleet officer she managed to keep up with some of her fun past times such as dancing. She would push so hard to get herself into the academy that her acrobatics took a place further down the line. During her time in Starfleet she managed to get some nice assignments however it wasn’t until the Dominion War that she really came into her own. She was injured a few times during that war and eventually was put on leave to heal up. She came back in time to participate in the last few major engagements in the war. 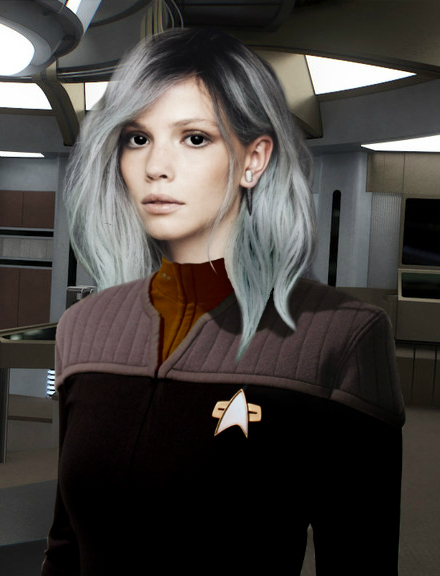 She wasn’t certain after the war if she wanted to continue on in Starfleet but she kept in because it was the most worthwhile place to serve.